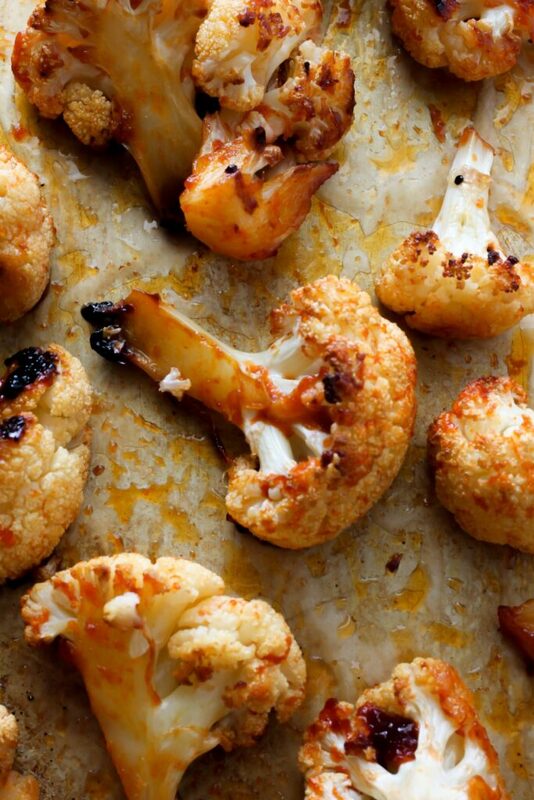 Spice up your veggie routine by roasting your cauliflower! 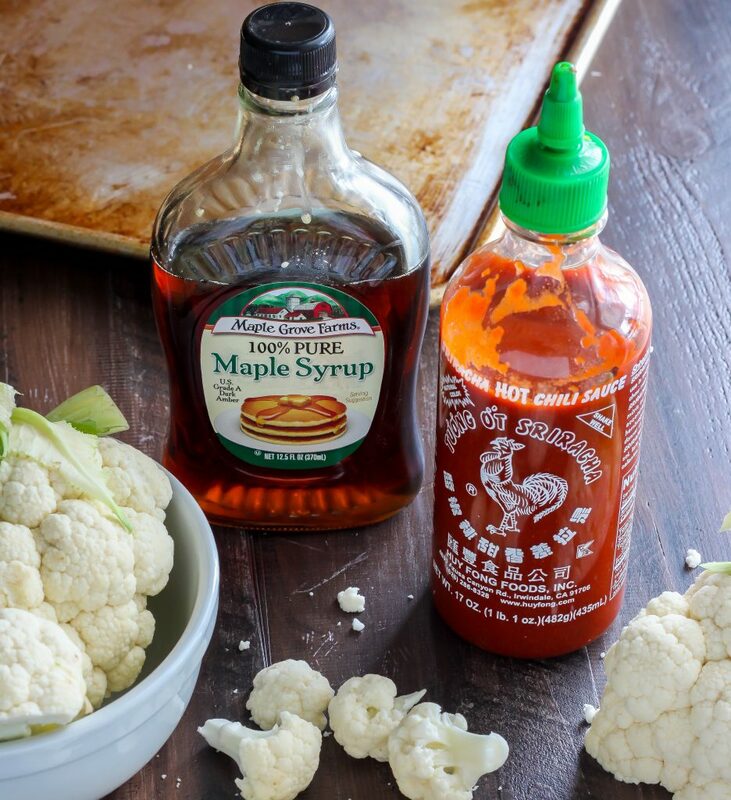 Flavored with bold sriracha and sweet maple syrup – this is one you’ll want to make over and over again. Happy Thursday! I hope you’re all enjoying this week so far… and if not, hey – tomorrow is FRIDAY. So there’s that. It’s been cold and rainy here, and my iphone says more snow is most likely heading into town this evening. The silver lining? Our fridge is stocked, the wine cart is full (always), and season 3 of House of Cards is calling my name. Crappy weather has its perks! Are you getting snow this week, too? Or are you one of the lucky ones and reading this from a tropical island? Endlessly adaptable (wanna use honey in place of the maple? Be my guest! Wanna add a poached egg on top and call it dinner? You go for it! 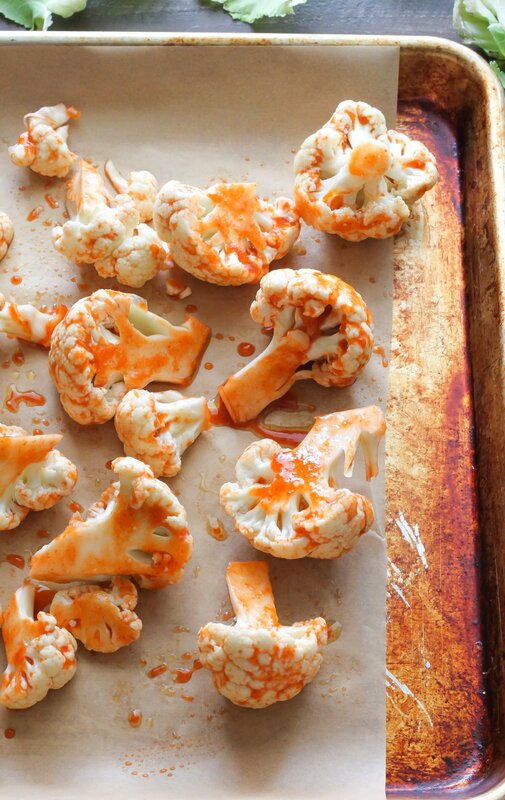 Wanna add extra sriracha post roasting? Get your spice on, friend!) 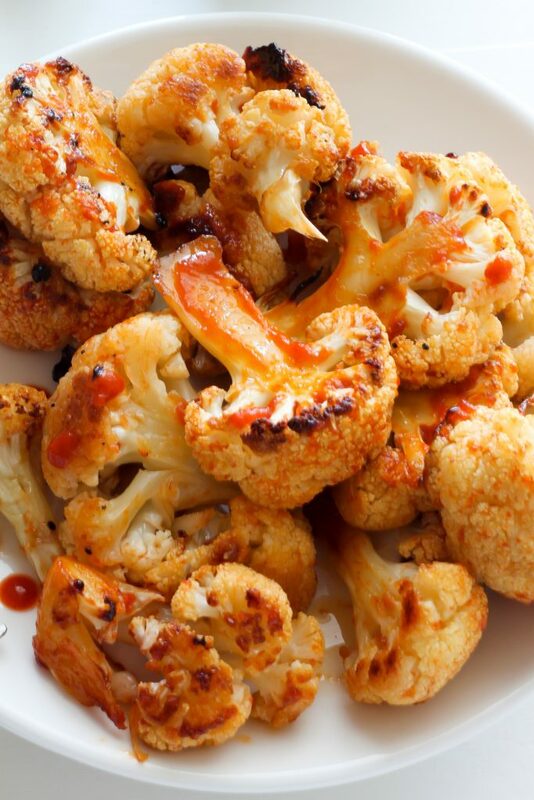 I hope you love this Maple Sriracha Roasted Cauliflower as much as we do! Cut the cauliflower into bite-sized pieces; transfer to a large bowl; set aside. In a small bowl combine olive oil, sriracha, maple syrup, salt, and pepper. 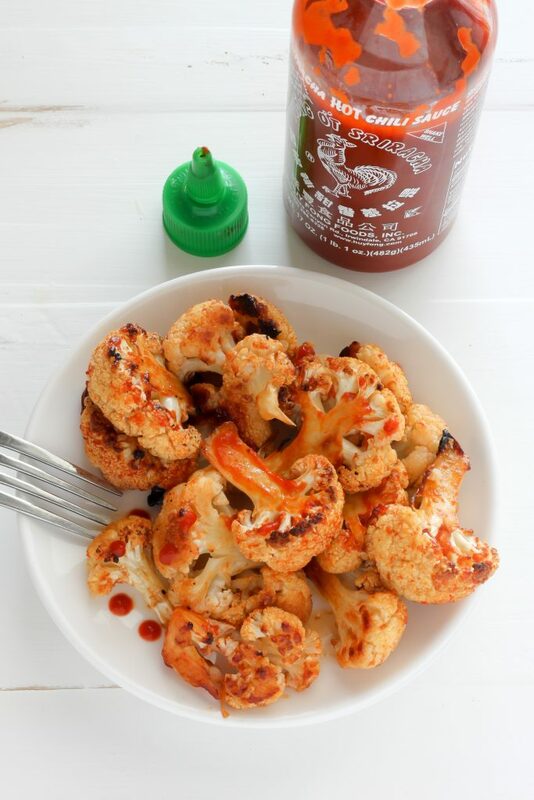 Pour the sriracha mixture over the cauliflower and mix well, making sure the cauliflower is well coated in the sauce. 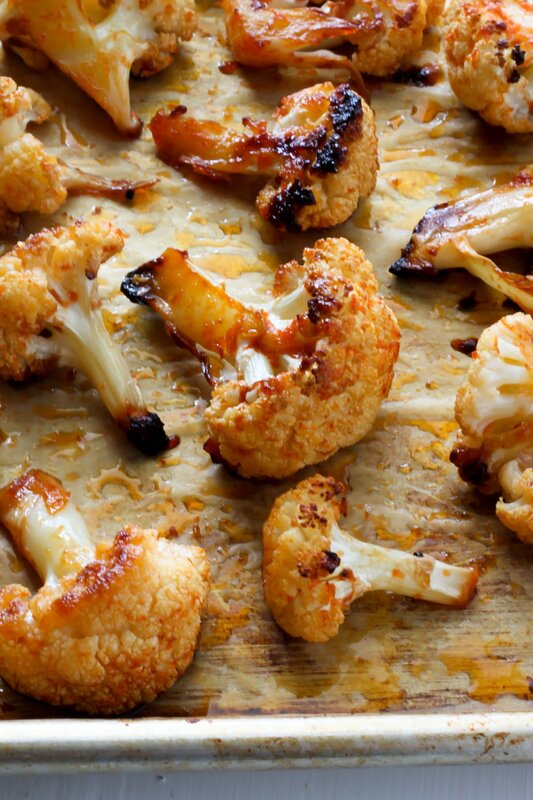 Spread the cauliflower onto a large baking sheet and bake for 20 minutes, stirring once at the half way point. Increase the oven temperature to 475 and bake for another 12 minutes, or until golden brown. Serve at once. 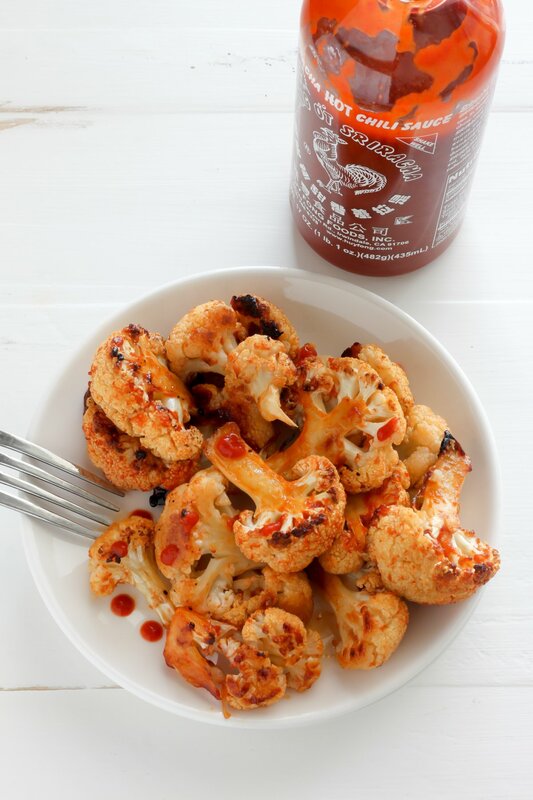 You can never go wrong with maple and sriracha! This is OUT OF THIS WORLD. I’m going to try Brussels Sprouts next week! THANKS! So happy to hear it, Nanette! I have made this with brussels and it’s just as tasty 🙂 Enjoy! I am making this right now!!! What should I serve with it? Hi Cheryle. This goes great with almost anything – chicken, fish, or even just salad. OmG this was DELISH!!!! I’m making it again tonight!!!! Thank you for sharing!!! I just made this and it is yummy. I can’t just have one. Isn’t it just so delicious?! Even my nephews beg for this veggie dish 😉 Thanks for the sweet comment, Rose. I just ate a whole head of cauliflower for dinner. Just slightly sweet with enough heat. Very good. Make it and love it. I make maple sriracha chicken wings they are amazing. So happy to hear it, Joanna! I love this stuff! I’ve served it with main courses, eaten it cold from the fridge as part of my lunch, and srved it warm as an appetizer at parties. Everyone loves it! This was amazing! The spicy sweet was so perfect and I know I’ll be using this recipe again! AMAZING! I only had 10 oz of fresh cauliflower so I used about 6 oz thinly sliced carrots, too. I also substituted water for most of the oil and just used about a 1 tsp melted coconut oil. Then I sprinkled all of it with 16 whole raw almonds, 1 tsp roasted Saigon cinnamon, 1 tsp black pepper, 1/2 tsp pink Himalayan salt, and 2 tsp turmeric. I am estimating all of that since I don’t really measure that stuff. 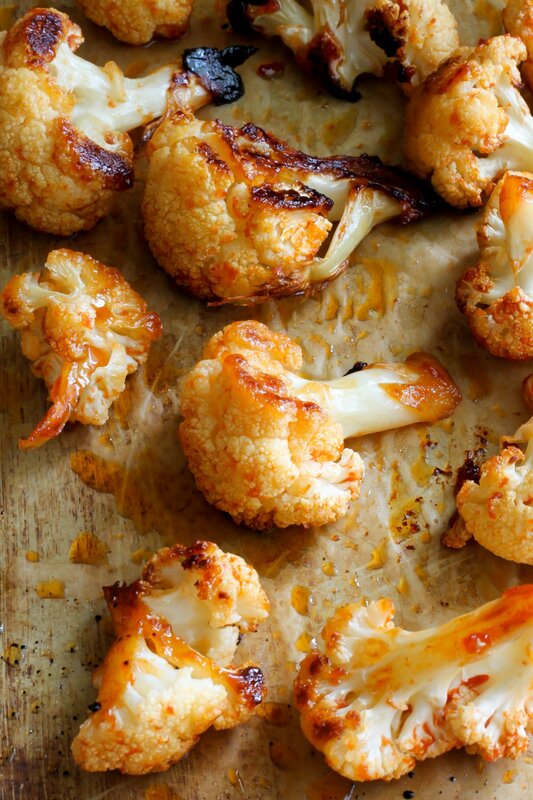 The added ALMONDS AND CARROTS were incredible and the cauliflower just soaked up so much flavor! Incredible!! Enjoyed this with supper tonight. Thanks! I made this and it was great! I was wondering if I made a triple batch and the mashed it like potatoes? 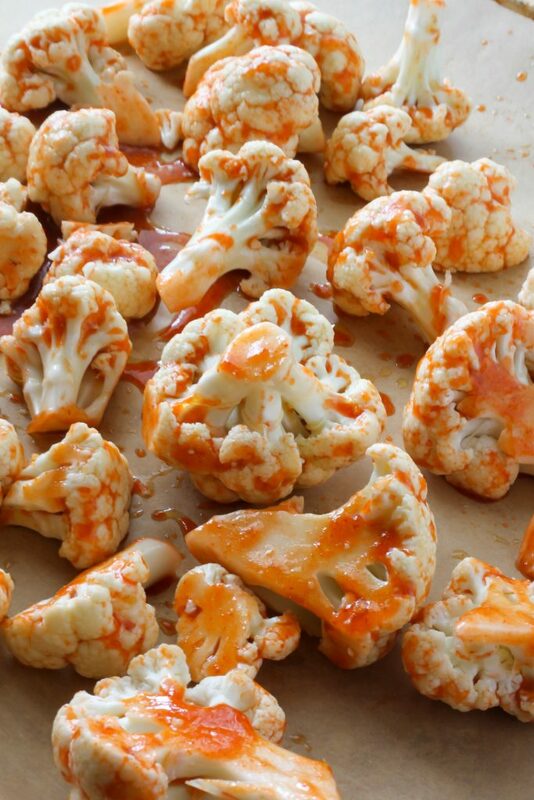 Hi..can you use frozen cauliflower to make this dish? How would this alter the recipe? For those who don’t eat meat, this cauli is AMAZING with a baked sweet potato! Awesome! I made this the other day and it was fantastic! Even my husband who is not a big veggie fan liked it. I am not always sure if he is just being nice when he says he likes new things I try or if he really likes it especially with veggies. He always takes left overs in his lunch the next day and when I saw him put the cauliflower in as well I knew this recipe was a keeper. He also shared it with one of his fellow employees and he liked it as well and wanted the recipe.